Celebrate Vitamins is a sponsor of the 2019 Bariatric Foodie Pledge! In celebration of the Pledge, they are offering a special discount! Take 15% off your purchase with code Pledge19 through March 2! See if you can identify with this sentiment. You’re newly post-op and you have a LOT of requirements. You have to get so many calories and so much water and on top of all of that you have to get your vitamins. It’s stressful, isn’t it! That’s why I’m a big fan of things that can do double duty. Protein shakes that double as liquid intake and possibly your vitamin does, stuff like that. 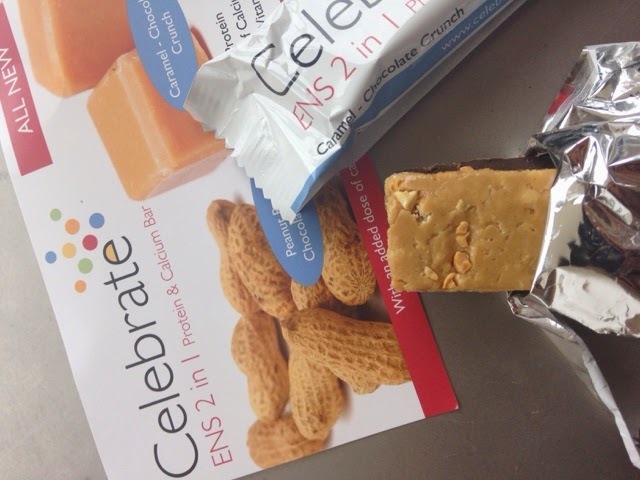 To that effect, Celebrate Vitamins has a new product offering for you – protein bars that help you get your vitamins! Caramel Chocolate Crunch: 130 calories, 3g fat, 18g carbs, 5g fiber (so 13 net grams of carbs), 5g sugar, 5g sugar alcohols (combo of polydextrose and malitol), 15g protein. Peanut Butter Chocolate Crunch: 140 calories, 4.5g fat, 17g carbs, 4g fiber (so again, 13 net grams of carbs), 4g sugar, 4g sugar alcohols (again, combo of polydextrose and malitol), 15g protein. So here’s where I need to make a comment on the nutritional content, because I give this information and people freak out. Yes, there are sugar alcohols in this. If you are particularly sensitive to sugar alcohols you should take heed. If you don’t have a particular sensitivity, from my experience (and keep in mind I’m not a registered dietician) 4-5g of sugar alcohol usually doesn’t do anything too terribly wonky to your system. So take that for what it’s worth. 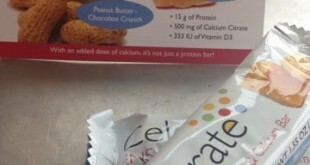 Each bar also contains 500mg calcium citrate and 333 IU of Vitamin D.
Texture: As you can see in the above photo, the bars are coated but beneath that they are sort of like a rice crispy treat. Crispy yet chewy. The texture helped it to not be too heavy. But then again I’m 6.5 years post-op so newbies, take that with a grain of salt! Cost/Value: A box of 7 bars is 15.75, which comes out to $2.25/bar. Each bar is about 1.5 oz. I always struggle with what a good “value” is with regards to protein supplements. I mean on the one hand you’re getting 15g protein out of 1.5 oz. of food mass. To give a comparison, 1.5 oz. of chicken is about 8-ish grams of protein, the same amount of tuna is about 5g. So if you really are limited in how much you can eat, it may be worth the investment, especially considering you are getting calcium and vitamin D as well. Overall verdict: I actually would order the Chocolate Peanut Butter Crunch. Why? Because I often forget to take my last calcium/vitamin D supplement! I like these bars and don’t envision it’d take much to convince me to have one as a snack. There’s that other calcium dose I need. As for the Caramel, I’ll leave that to true caramel lovers. To learn more about all of Celebrate’s great offerings, visit their website! What say you, Foodie Nation? Who’s tried these bars. What did YOU think? I’d love to hear (and I’m sure your fellow Foodies would appreciate additional perspectives). Let me know in the comments! 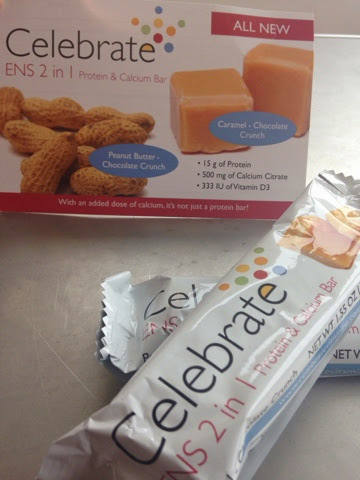 Five Reasons to “Celebrate” ENS 2 in 1 Protein & Calcium Bars!